By Baptism a child is brought into the Christian community, is incorporated into Christ’s Body, and begins to live with the very life of Christ. The full wonder of Baptism cannot be expressed here, but to help all in our parish to understand something of it the following guidelines will be followed always. The community aspect of Baptism is often stressed in the rite. The local community welcomes the child into its midst with great joy, while realising the important part it has to play in supporting the parents in fulfilling their responsibility and pledge to be a channel for the grace of God. Infant Baptism is but a seed to be nurtured by the parents – something often stressed in the rite. The priest reminds parents that they are to be the “first and best teachers in the ways of faith”. There is a problem to be faced when parents do not hold much promise of being good teachers in the areas of faith. Perhaps they seldom participate in Mass, pray hardly at all, and have little or no knowledge of or interest in the faith. The Rite of Baptism then says that the parish priest may defer the Baptism for a while. The Code of canon Law states that “for an infant to be baptised lawfully it is required that there be a well-founded hope that the child will be brought up in the Catholic Religion.” (Canon 868 No. 2) Pope John Paul II said in 1980 that if the assurances of an upbringing in the faith cannot be honestly ascertained, then “there can be grounds for delaying the sacrament; and if they are certainly non-existent, the sacrament should even be refused”. 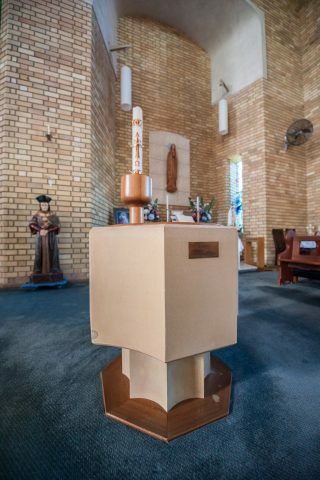 If you would like to have a child baptised, please call Parish Office on (02) 9567 3589. Naturally, given the nature of the sacrament as welcoming a child into our Catholic family, it is appropriate that baptism be celebrated in the parish where the family attend Mass. We the parents request that our child receive the Sacrament of Baptism. We understand that Baptism establishes a bond between our child and God and thereby links our child with all others who are His followers. As members of that church we believe all that Christ taught us and we wish to pass on to our child the faith that is ours, and so we will try to set an example of true Catholic living.